In 2010 Andrew Dilnot was asked by the government to propose a solution to the crisis in social care. There was wide agreement that this eminent economist, a teetotaller who used to have a map of London poverty framed on the wall of his office, would produce a thoughtful report. Today, more than a year after he published his recommendations for the reform of the social care system in England, the Government has responded with a plan of their own. What happens under the current system? As part of our series analysing the plans to reform social care in England, we've already looked at the current system and its iniquities. "Around 10% of us end up paying more than £100,000 in care costs." This '1 in 10' figure, quoted by Mr Hunt, is one that appears in Mr Dilnot's 2010 report. It's not an official statistic, but a best estimate based on a simulation model developed by the social science departments of a trio of leading universities (LSE and the Universities of York and Kent). 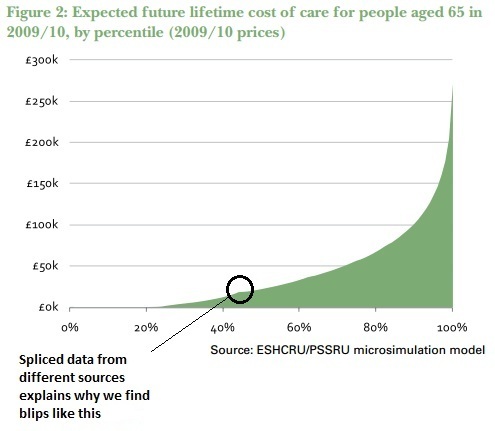 The graph below shows that while 1 in 4 (up to the 25th percentile approximately) will spend very little money on formal social care, a similar proportion of us will spend more than £50,000 (from the 75th to the 100th percentile). Under the current system, there's no social insurance to protect an individual against catastrophic care costs - that is, unless you have virtually no wealth to speak of (less than £23,250 including the value of your property). In these cases your care is subsidised by the local authority. Many of those who've saved up for their retirement, who've spent their lives contributing to the tax system and who find themselves struggling with the onset of old age and its attendant health problems, will die in a care home having spent all their assets on their own care. What's more, without any national eligibility standards, the level of social care that you're entitled to is essentially determined by a postcode lottery. "the current adult social care funding system in England is not fit for purpose and is in urgent need of reform." What did the Dilnot report propose? What has the Government agreed to? Mr Dilnot suggested a cap on how much anyone would be required to pay for their care costs over the course of a lifetime, suggesting a ceiling of between £25,000 and £50,000 (in 2010/11 prices). Beyond this point, the state would take on responsibility for the majority of the bill. The Government today announced that from 2017 it intends to establish a cap of £75,000 in 2017 prices which, according to Mr Dilnot's calculations, equates to approximately £61,000 in the 2010/11 prices (the basis of his report). If we're to make a claim about the extent to which the Government has 'watered down' Mr Dilnot's proposal, it's crucial that we account for this inflationary effect. At a time of austerity, the Coalition has been less generous than Mr Dilnot recommended. However, we're looking at a difference of £11,000, not £25,000. The Government estimates that a higher cap will reduce the cost of the policy to the Treasury to £1 billion (a cap of £50,000 would cost £1.3 billion in 2010/11 prices and a £25,000 cap would have been priced at £2.2 billion). The Dilnot report also included the recommendation that the current means-test threshold be extended from £23,250 to £100,000 with a taper (so, for instance, someone with £80,000 of assets would pay more towards their care than another person with £35,000). This would mean that more people are entitled to receive some level of financial assistance from the state. The Government has proposed an upper threshold of £123,000 (close to £100,000 in 2010/11 prices). Combined with the cap on care costs, this would mean that there would be fewer people left to fend for themselves. The cap on care payments does not include the "hotel costs" that a care home will charge. In other words, people in residential care will still need to pay (at the Dilnot report's estimate) between £7,000 and £10,000 per year to fund their accommodation and living expenses. This means that an individual will pay more than £75,000 in total before the state picks up the bill. Once someone enters a care home, the 'meter' will begin ticking: the local authority will intervene once their contributions arrive at the cap. The length of time that elapses before the local authority picks up the bill is determined by the standard price that the local authority will pay for residential care. It is not based on what the individual happens to be paying. People who live in areas of the country where the cost of residential care is more expensive (much of the south east of England) may be paying considerably more per week than the local authority's set rate. If there's a wide gap between what an individual is paying and their local authority's fee, that person will likely end up spending more than the £75,000 before they're entitled to assistance. "...will, the Treasury claims, help 100,000 extra pensioners when the changes are introduced in 2017." Until we know more about how the Treasury or the Department for Health has produced this number, it's tricky to assess how robust it is. There's a severe paucity of data in the field of social care and as such any figure is likely to be an extrapolation. The success of these measures is dependent on the assumption that people are able to buy an insurance policy to protect the depletion of their assets. The Association of British Insurers has welcomed the Government's proposal. At the moment, with no limit on the amount of money that someone might need to spend, the financial sector has shied away from offering liability insurance as it's near impossible to predict risk. "it will help just 10% of those needing care". The NPC have confirmed that this statistic is based on the figure that 1 in 10 people will pay more than £100,000 for their care. It says that although the Government's proposed cap is £75,000, this does not take into account someone paying living costs of up to £10,000 per year, in effect raising the cap to near £100,000. This is something of a back-of-the-envelope calculation, even though it's fair to say - as Mr Dilnot acknowledges in his report - that there's a lack of reliable data on which to base any claim about who will benefit and who will be penalised. Nevertheless, the NPC appears to be underestimating the number of people who would benefit from the new scheme. The Department for Health estimates that 16% of people would spend more than £75,000 for their care if the cap were not in place (so 16% of people who are currently on their own will receive protection from the state). However, the percentage who will receive assistance increases if we include the number of people who will qualify under the extended means-test. The Labour party has suggested that the Government's policy offers too little, too late. We've looked into their claims in more detail. The Government has also come under attack for how it plans to pay for its reforms. At a time when Whitehall is seeing the contraction of budgets, any considerable expenditure must be justified. In this case, the Government needs to find an extra £1 billion per year. The Coalition has reneged on its promise to increase the inheritance tax threshold and has instead announced that the rates for individuals and couples will be frozen from 2015 (at £325,000 and £650,000 respectively). The media reported that this will pay for 80% of the bill, while an increase in National Insurance contributions from employers will fund the remaining 20%. "The move will affect some 5,000 wills a year and could leave some families £95,000 worse off than if the tax had been raised in line with inflation". The Government has owned the 5,000 figure, although we're still waiting for confirmation of the £95,000 statistic. As part of our series, we've also investigated how many people under the current system have been "forced" to sell their homes to pay for their care and whether or not the Government's new policy will protect people's housing wealth. Integration: the future of health and social care?